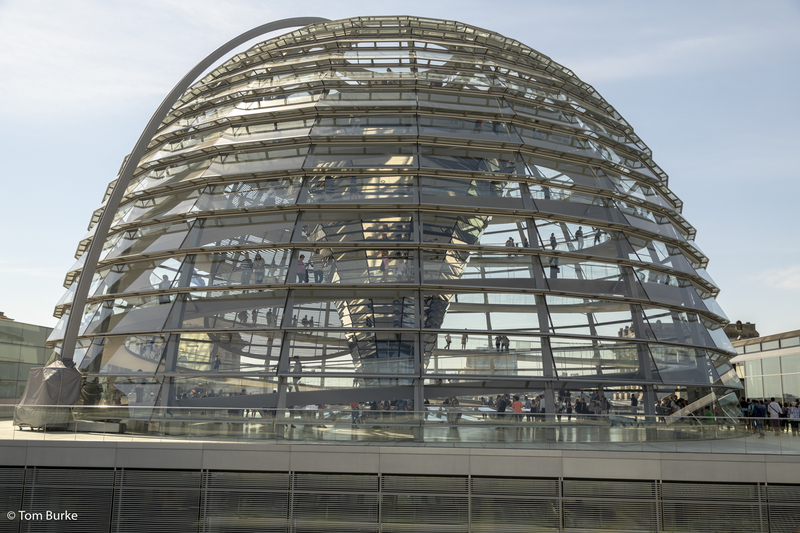 On the morning of my first full day in Berlin I visited the dome of the Reichstag. Sounds fascinating…. Actually, it was interesting and certainly dramatic looking. The Reichstag building is where Germany’s parliament meets. However, that’s always been the case. The building was completed in 1894 and was used thereafter just over 20 years by the parliament of the German Empire. In 1918 following the defeat of imperial Germany and abdication of Kaiser Wilhelm II the Weimar Republic was proclaimed from a balcony of the building, and it was used as the parliament building for the republic. Then in early 1933 the National Socialists came to power, and shortly afterwards a fire gutted the main meeting chamber. This was used as the pretext for emergency rule – i.e. rule without the need for parliamentary approval – and for the rest of the Nazi era the Reichstag building was unused. Then it was damaged both in the bombing of Berlin and during the final battle for Berlin at the end of WWII. There’s a famous image of the Hammer & Sickle flag being raised on the roof by red army soldiers during their capture of Berlin.